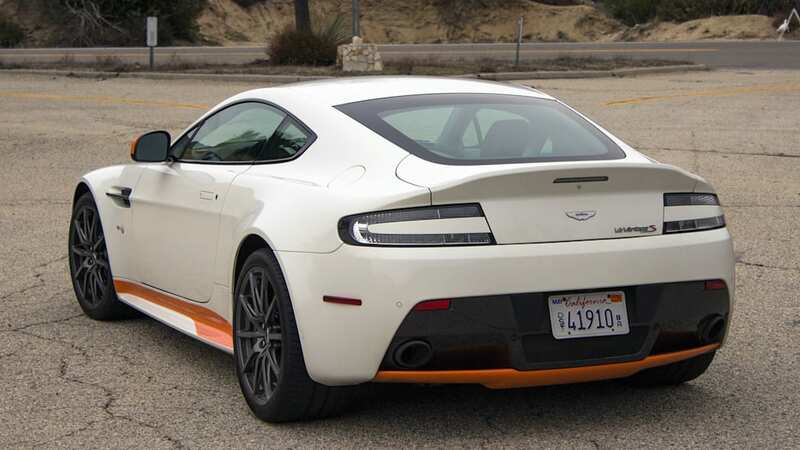 Autoblog rating for the Aston Martin V12 Vantage S is not available. Please check back later. Here's a deliciously subversive thought for you: Stats are ruining enthusiast cars. We use them to rank the latest models, critique them, and deify them. Sometimes the numbers happen to align with a bunch of intangibles, and the car becomes transcendent – like the Ferrari 458 Speciale, a very special thing indeed. There are cars with great numbers and very little charisma; I've driven many of them. And then, there are the number-based narratives that mislead us. For example, the hoopla around the Mazda MX-5's horsepower, or the continuing lack of a Toyobaru with a turbo – frustrating crosstalk about purist platforms better understood on track than on paper. 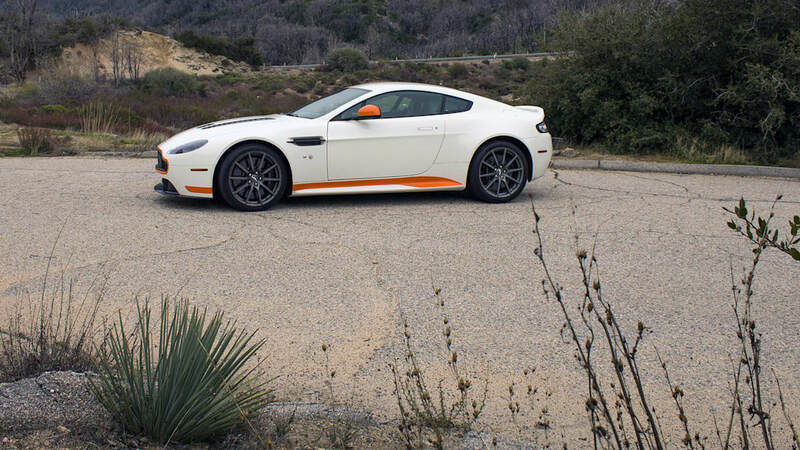 The 2017 Aston Martin V12 Vantage S is flawed, old, and weak – so say the insidious numbers. A mechanical watch doesn't keep time as well as a quartz one, the numbers say. A tube amplifier produces an inferior sound, the numbers say. The way to fight back is to stop this slavish devotion to the stats and go wind the thing out on good roads in imperfect conditions, which is to my mind the ultimate test of a grand tourer's competence. Southern California was rocked this winter by wild weather – much of the Angeles Crest Highway that dances along the spine of the San Gabriel Mountains was closed due to heavy snow. So much for Plan A. Some roadside rerouting led to some promising roads, so I pointed the Aston into the curves. 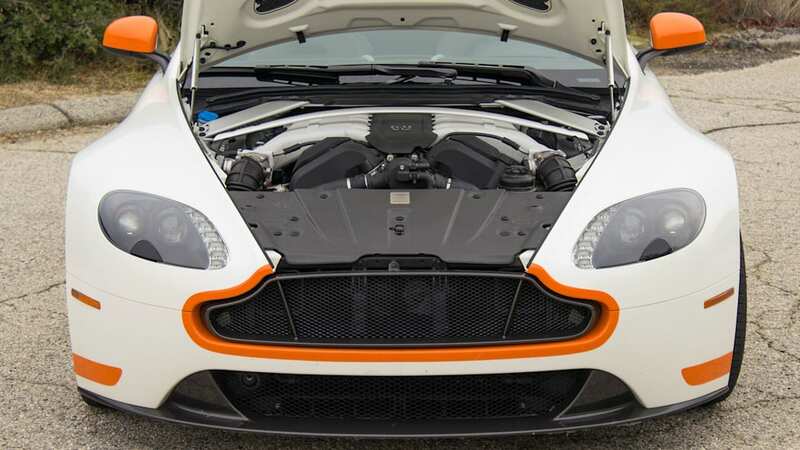 The V12 roar is a profound part of this car's appeal. Uphill and building steam, the Vantage is a symphony's brass section playing the sounds of wolves on the hunt. Downshifts yowl and snarl like a pack crashing through the underbrush in search of prey. Under deceleration, it sounds like lupine static, unearthly and resonant; wound out it's a frenzied whir. Every stab of throttle brings an immediate response: sound and acceleration in equal measure. If you have even the barest appreciation of joy, you can't stay out of the throttle. This is soulful, warm, analog – but merely honest rather than consciously retro. There's nothing here trying to simulate an authentic experience – it is an authentic experience. 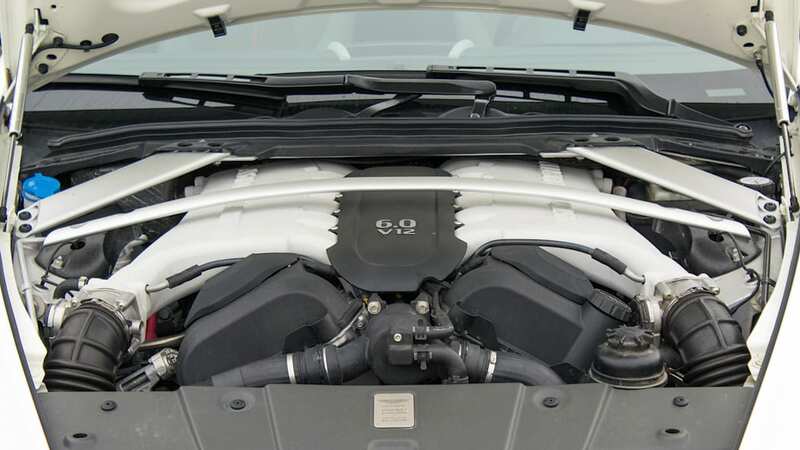 It's all right there, under the long and delicate hood – twelve cylinders displacing 5.9 liters. And inside the cabin, a seven-speed manual gearshift lever that moves through a dogleg pattern. This watch requires winding; it's a tactile experience that the quickest, most sophisticated dual-clutch automated manual can't touch. 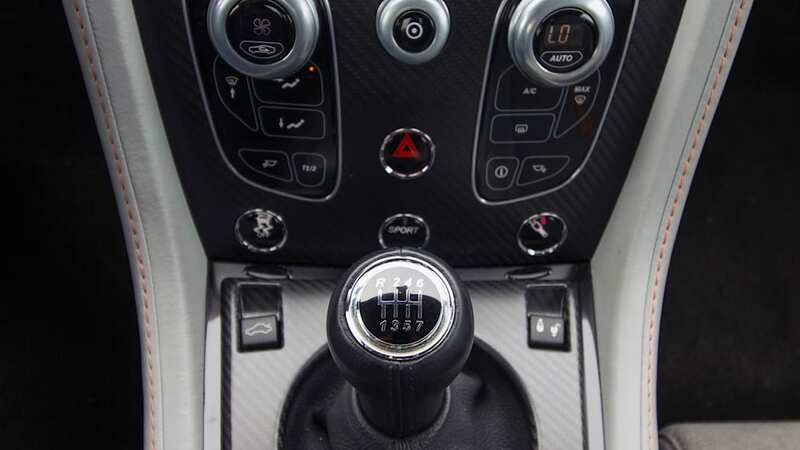 I can't describe the several-millisecond difference between the Camaro ZL1's 10-speed automatic and Porsche PDK's shift time, but I know – in intimate detail and perfect clarity – when I nail a 1-2 shift on the Aston's dogleg box. Or when I miss the 3-4 upshift and go into 6th, which happened at least twice. 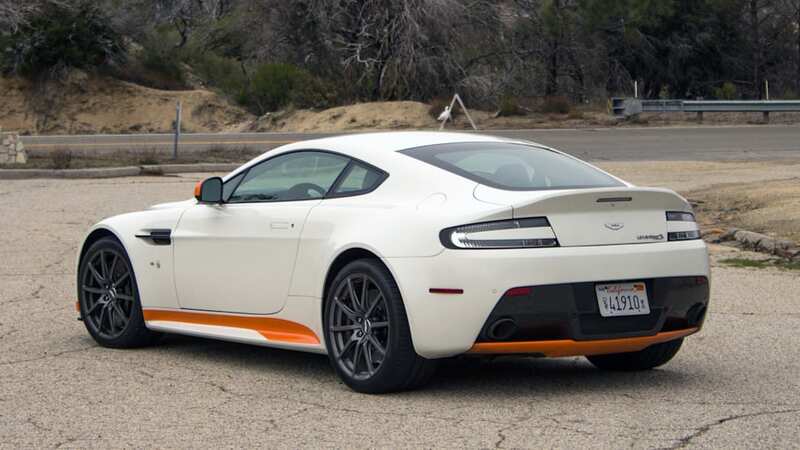 The pattern would be tidier with two fewer gears – there's plenty of torque to handle bigger ratio jumps, and it's not like an extra overdrive or two is doing much to help out the V12 Vantage S's drinking problem. Save yourself the psychic pain of watching the fuel gauge, or worse, the trip computer's consumption figures. 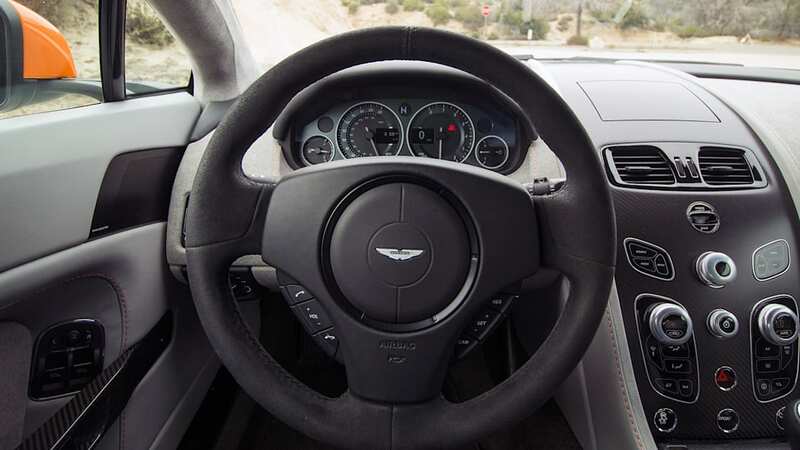 The manual transmission is a rare piece of the Aston feels like it's there to compete in the arms race that inflicts the high-performance genre. Otherwise, the more this car diverges from the pack, the better it becomes. That's in part because as its competitors introduce immense complexity for incremental gains in efficiency and huge power numbers, they also have to go to enormous lengths to camouflage the hardware's unsavory attributes. 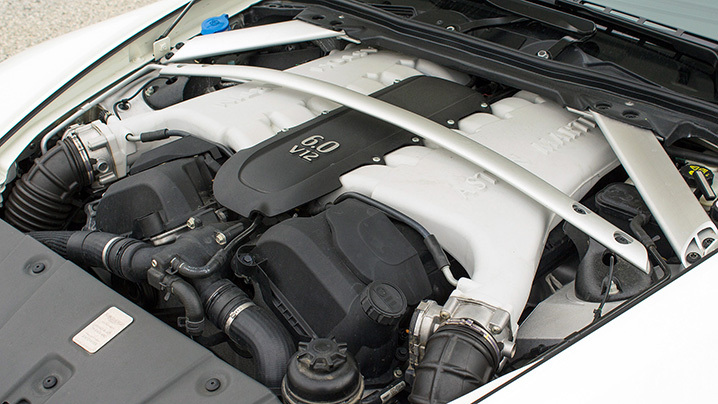 Think of piped-in or simulated sounds that try a bit too hard to make up for the fact that a direct-injection, forced-induction engine sounds like eight sewing machines brawling with a vacuum cleaner. And think of how much effort – the thousands of lines of code and exotic plumbing – that goes into making turbocharged cars seem like they aren't. The number chasers try to cover their tracks, but the insincerity shines through. 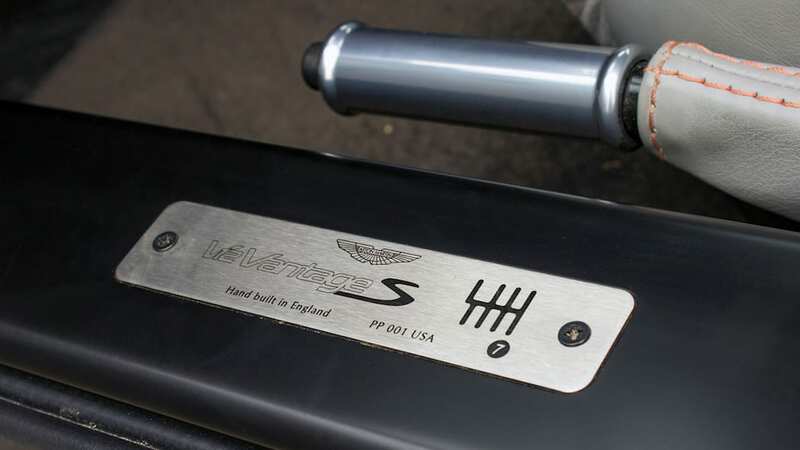 The Aston's honest appeal begins with the sheetmetal. 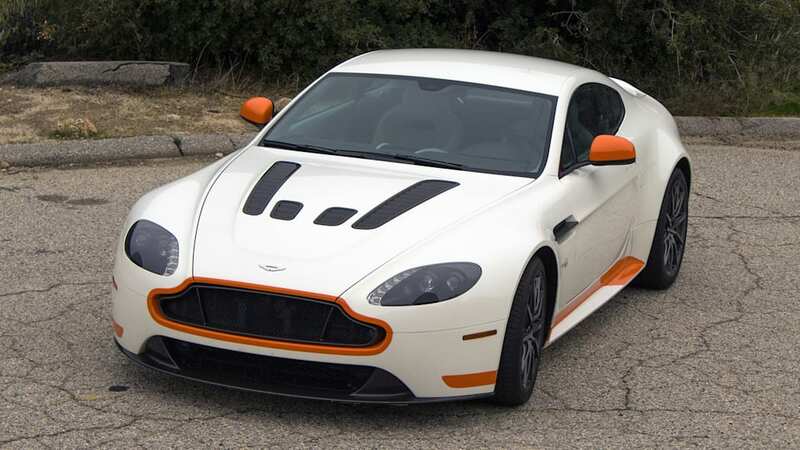 The Vantage has been part of the Aston stable in the US since late 2005, so it's in the twilight of its long existence, but it's also a timeless, contemporary design. It's smaller in real life than it looks in photos, and the sheetmetal is tightly drawn around its underpinnings. In particular, the Vantage's nose adopts radii that should have gone extinct with the advent of pedestrian impact standards. Someone obviously spent a lot of time caressing some modeling clay with their bare hands to get the look just so. Even without this version's orange accents, apparently ripped from a Nike shoe, it's organic and classically beautiful. The underlying structure is Aston's VH architecture, composed of extruded and bonded aluminum elements paired with more aluminum, magnesium alloy, composite, and steel. 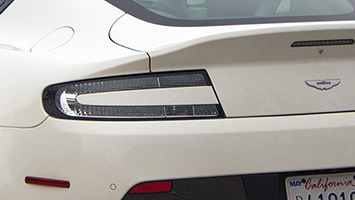 The front and rear splitters are carbon fiber, as is the front grille – although the mesh in the grille and side strakes are titanium. Despite the knock against numbers, here are a few – and remember they're not the yardstick. 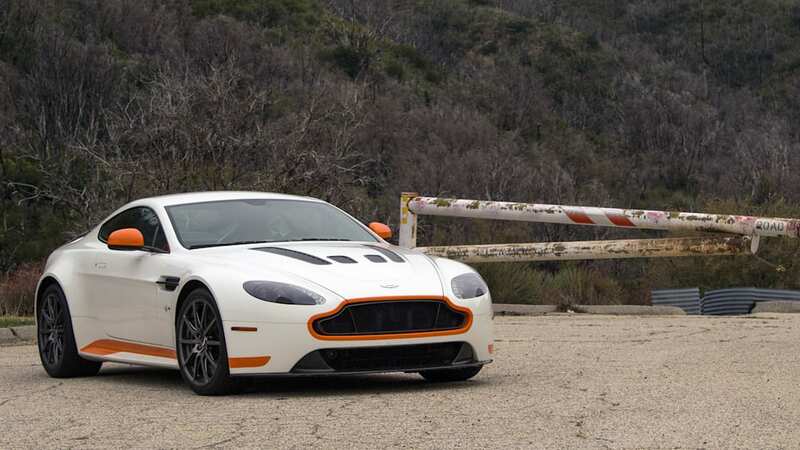 The V12 S is good for 565 horsepower and 457 pound-feet of torque, substantial but not eyebrow-raising figures that inform the Vantage's thrust and the quality of its power delivery. That V12 has 3,670 pounds to pull around, but it feels lighter than that and has near-perfect front-to-rear weight distribution. Without forced induction, there's little attenuation between driver input and power output – it's linear, mechanical, and utterly predictable. The same can happily be said for the steering, which lays all its cards on the table. It's hydraulic, and the assist has heft but not drag. Aston has the variable assist calibration nailed, so at every speed there was no disconnect between how far I moved the steering wheel and how the front tires behaved. Likewise, there was never a question about placing its engorged fenders within a lane. The best electronically assisted racks try ever so hard to approach this 1:1 relationship between driver expectation and steering response, but fall into an uncanny valley of sorts – there's something off, slightly, and it is disconcerting. 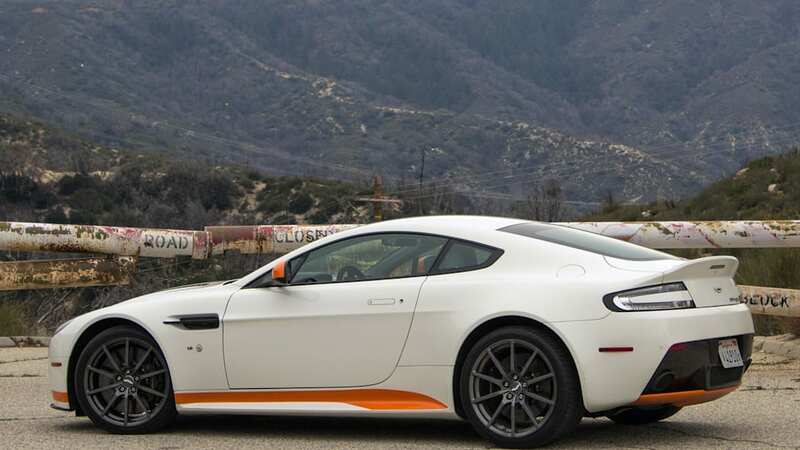 No such flaw here: The Aston was as game to steamroll down LA's tortured concrete interstates at speed as it was to dart around Big Tujunga Canyon Road's curves. I was lucky to have found something still open up in the mountains. The crazy weather had closed much of what I'd hoped to sample, and it had torn this road up, too – dirt and rocks hiding around many corners, rough pavement, the occasional pothole. It's the sort of situation that makes a hard-edged, rigid sports car like an Alfa Romeo 4C shiver like a Chihuahua. 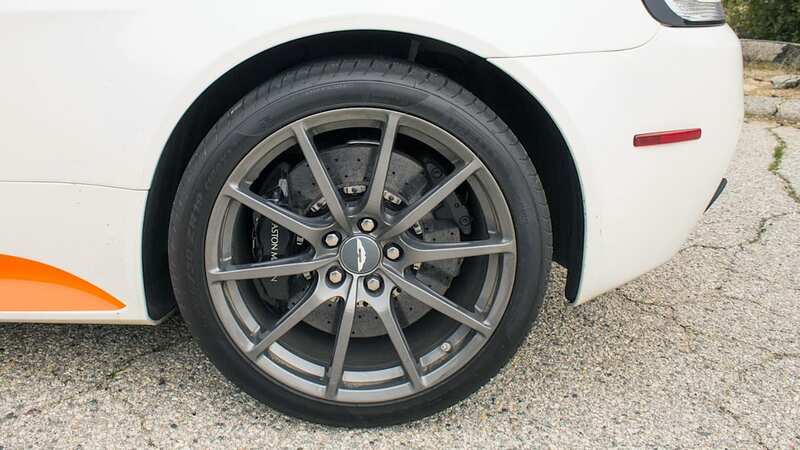 But when you hang adjustable grand touring suspension with plenty of compliance off a rigid platform like the Vantage's, you get to have more fun with less skitter. In the suspension's normal mode, the V12 Vantage S handles a bit like a first-generation Miata: There's a smidgen of roll, but it enhances the feeling of speed and helps soak up the rough patches – although, unlike with the Miata, the suspension is doing most of the work, not the Flexible Flyer chassis. Stab the suspension button and things stiffen up noticeably. Body motion is better controlled, there's more immediacy to the car's responses, and more information filters up through the wheels, and then dampers, and finally into the cabin. It's still not harsh, but rather more alive. I found I'd stiffen up the suspension when I had a clear view ahead of several smooth, linked turns and carve through them like a slalom skier. Neither mode has much of a downside, and each has its charms. Not to say that you don't give something up for the analog experience. I wouldn't trade the manual 'box for its rough, uncouth automated-manual predecessor, which rapped you with a ruler every time you asked for a shift, but I did wish for a silkier action. The shift gates are narrow, and effort is high. 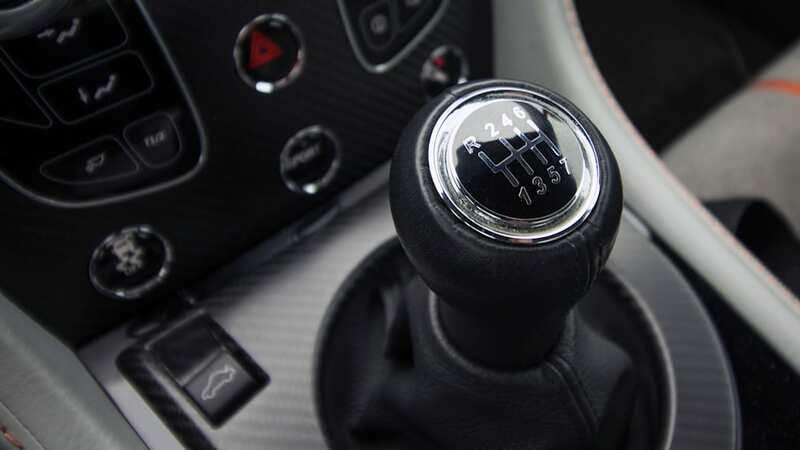 This isn't a wrist-flick box; it's much like the Corvette's seven-speed manual, which is unrelated, in the effort and particular deliberateness needed to nail a shift across the pattern. The infotainment system is also creaky, but a long stab of the power button causes it to fold out of sight and mind. You don't need it for much, and woe to the philistine who prefers talk radio to the pipe-organ aria of the V12. While I'm enthralled by the mechanical-analog aspect of this Aston Martin, technological sophistication is captivating for other reasons. If it's gizmo-wizardry you seek, there's not much to be had in the Aston. Mid-drive, my mind kept returning to the McLaren 570GT, a much different take on many of the same sporty touring tropes as the V12 Vantage S for about the same money. It's a mid-engined, carbon-fiber monocoque job with a bunch of motorsport-derived DNA baked in. 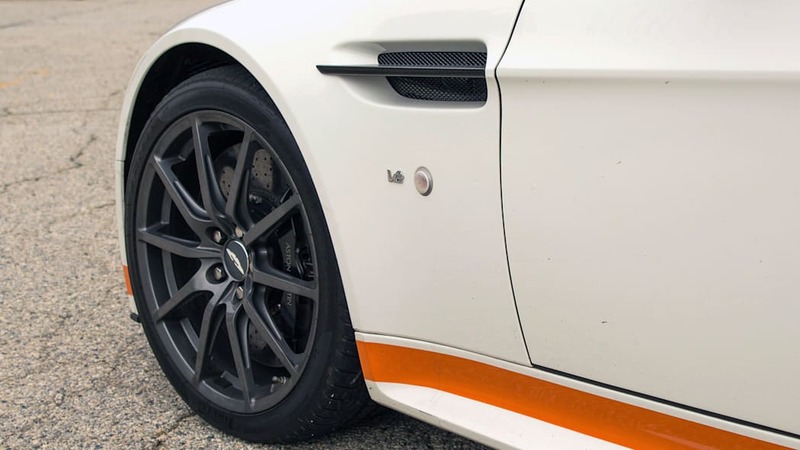 It's a lot of what the V12 Vantage S isn't – there's no manual, and it packs a small-displacement, high-revving, twin-turbocharged V8. I love how special the McLaren feels: the exotic noises – high-pitched, whirring, alien – the thrust, the spacecraft interior, how it stands out like a million-watt neon sign in traffic. Despite the incredible physical and philosophical differences between the two, there's a genre-bending appeal to both. I'd have to imagine that on different days, either might appeal to the same buyer. Maybe on a different day, I'd be torn, too. 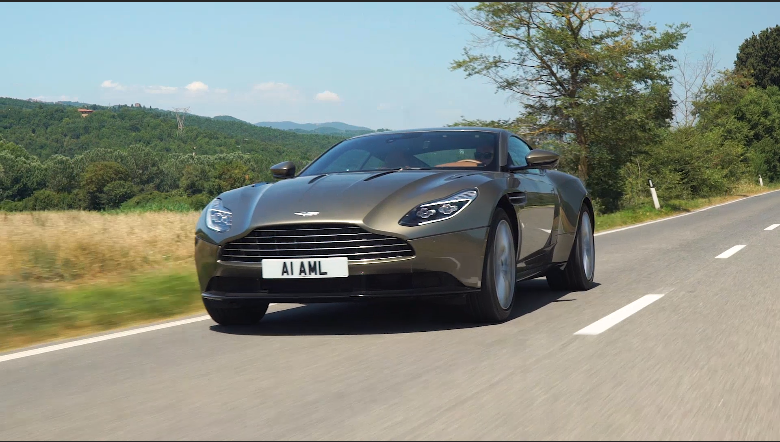 But fresh from the Aston, its V12 has my heart – a subjective, and personal, realization. 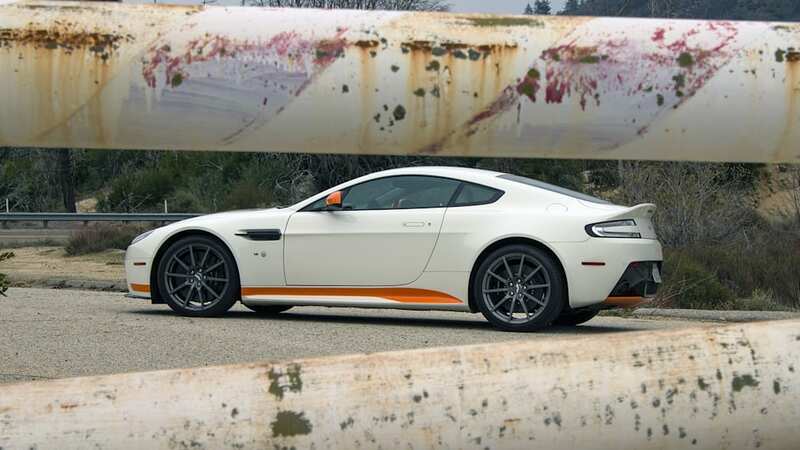 Automakers will keep making techno-savvy cars like the McLaren, but the analog, naturalistic V12 Vantage S is almost certainly the last of its kind. I forgive it its foibles to hear that siren engine howl around another bend.